Seaboard Graphics specializes in custom full-color Offset printing, digital printing, apparel printing and large format printing. Our state-of-the-art equipment and an expert staff with over 65 years of collective experience in the printing industry allows us to offer the highest quality products and best service anywhere while still offering the industry’s most competitive prices. Through these extensive products and printing services we have helped many, businesses, and artists develop their ideas and bring them to the visual world of marketing and promotion. Always taking a personal approach to customer service, we continually strive to help customers big or small with the highest quality service and merchandise. 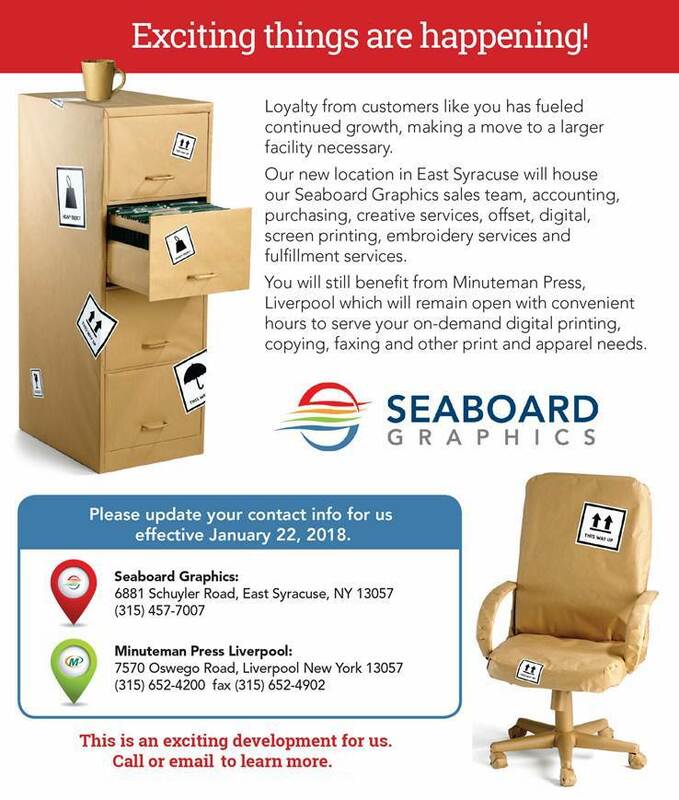 Seaboard Graphics is an independently owned and operated printing company that proudly calls Syracuse, New York its home. Believing in the success of its hometown, we are proud to show our support by combining a passion for business with the passion of community, people, and the environment. In the community we remain active by partnering with local businesses and organizations. As an employer we believe that the rhythm of our success is produced by the energy of the people creating the product as much as the product we create. We believe in being a pioneering environmental force. We address that responsibility in all aspects of our daily production. Through technology and creative innovation we have improved our efficiency to produce top-of-the-line products using recycled paper and soy and vegetable-based inks. As Seaboard Graphics has grown as a printing company, so has our ability to meet the growing challenges of our clients. We continually reinvest in ourselves while offering you the highest quality service at the lowest possible price. We like to think of our clients as friends, and every job is important in building that relationship. As you begin working on your next project look to Seaboard for all your Marketing needs, because our job is to get your business more business. Thank you for your support!